An officially convened 350-strong Citizens’ Jury has decisively rejected South Australia’s plans to import over half a million tonnes of high and intermediate level nuclear waste for long term storage, writes Jim Green. This has dealt a powerful blow against the project from which it is unlikely to ever recover, and represents a major victory for campaigners, indigenous Australians and economic sanity. On Sunday November 6, two-thirds of the 350 members of a South Australian government-initiated Citizens’ Jury rejected “under any circumstances” the government’s plan to import 138,000 tonnes of high-level nuclear waste and 390,000 cubic metres of intermediate-level nuclear waste as a money-making venture. The Jury was a key plank of the government’s attempt to manufacture support for the dump plan, and followed the SA Nuclear Fuel Cycle Royal Commission which released its final report in May 2016. The Royal Commission had a strong pro-nuclear bias in its composition but still rejected – on economic grounds – almost all of the proposals it considered: uranium conversion and enrichment, nuclear fuel fabrication, conventional and ‘Generation IV’ nuclear power reactors, and spent fuel reprocessing. 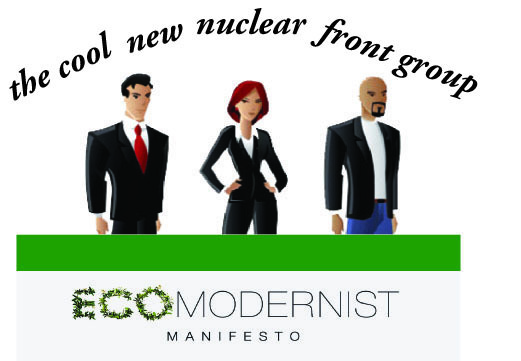 Australia’s handful of self-styled ‘ecomodernists’ or ‘pro-nuclear environmentalists’ united behind a push to import spent fuel and to use some of it to fuel ‘integral fast reactors’. They would have expected to persuade the stridently pro-nuclear Royal Commission to endorse their ideas. and that electricity generated from such reactors has not been demonstrated to be cost competitive with current light water reactor designs. The ecomodernists weren’t deterred. They hoped that the nuclear waste import plan would proceed and that it would lay the foundations for the later development of fast reactors in SA. Now it seems that the waste import plan will be abandoned, and the ecomodernists are inconsolable.